Professor Costas Grammenos, Chairman of the eponymous Centre for Shipping, Trade and Finance at Cass Business School has been appointed to the Maritime 2050 expert panel which will advise the UK government on maritime policy. The team will work with industry to help make sure the UK stays at the forefront of global shipping and will consider the impact of future initiatives including new technology such as autonomous ships and digital ports. Professor Grammenos said he was honoured to be appointed to the panel. “It is an honour and a challenge. The spectrum of the strategic issues that will be discussed at the Maritime 2050 expert panel is wide. Some of the topics have been researched, taught and debated over many years at Cass within our Shipping, Trade and Finance Centre. Yes, it is a challenging opportunity”. Professor Marianne Lewis, Dean of Cass Business School, said she was delighted to hear the news. “Professor Grammenos is a leading global authority on shipping, trade and finance. Over 40 years he has made a unique contribution to the global shipping industry by sharing his scientific and academic thought leadership,” she said. 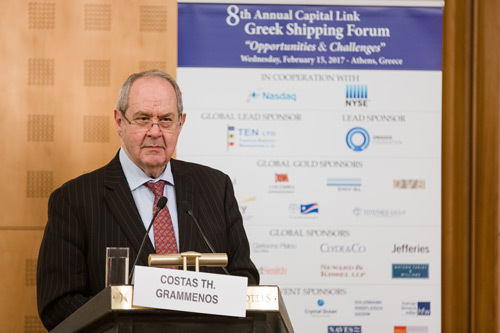 The Centre for Shipping, Trade and Finance was established by Professor Grammenos in 1983 and renamed in his honour in April 2007. It pioneers postgraduate studies in Shipping, Trade and Finance and Energy, Trade and Finance and offers the first specialist MSc degrees in these disciplines. Through its research and its unique blend of theory and practice, the Centre has gained international recognition among industry leaders, policy-makers, government and academics.